See that purple stream at the bottom right? It's the helical jet from a runaway pulsar that's streaking across the Milky Way at speeds reaching five million mph. But more extraordinary than that is how freakishly long this thing is. A pulsar is a type of rapidly spinning neutron star, which is the small and incredibly dense remnant of a much more massive star. Pulsars are known to produce long X-ray jets of high-energy particles — but this one's the longest ever seen. The pulsar is called IGR J11014-6103 and it was imaged by NASA's Chandra X-ray Observatory. It's located about 60 light-years from the center of the supernova that created it, SNR MSH 11-61A. It's one of the fastest pulsars ever observed. NASA estimates its speed as being somewhere between 2.5 million and 5 million mph (about 1000 km/s). "We've never seen an object that moves this fast and also produces a jet," said Lucia Pavan of the University of Geneva in Switzerland in a NASA statement. "By comparison, this jet is almost 10 times longer than the distance between the sun and our nearest star." That's over 37 light-years in length. In addition to its impressive span, it has a distinct corkscrew pattern that suggests it's wobbling like a spinning top. It's also generating a cocoon of high-energy particles, called a pulsar wind nebula, that enshrouds and trails behind it in a comet-like tail. 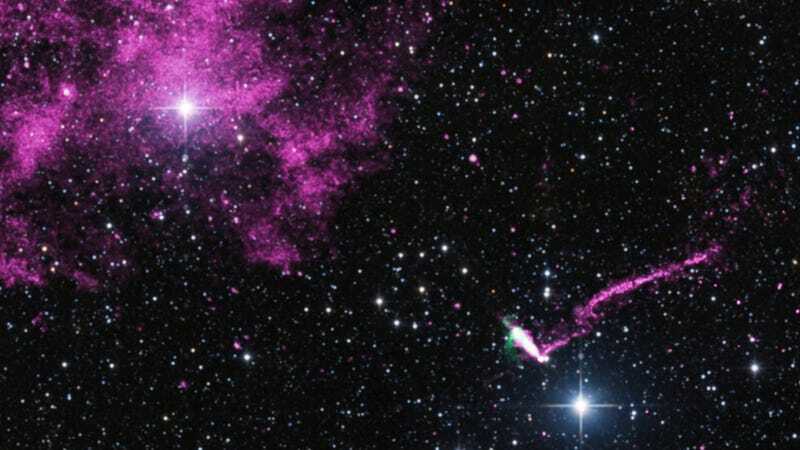 According to NASA researchers, the engine driving the pulsar's high speed is likely due to an uneven stellar core collapse during the supernova explosion that spawned it some 10,000 to 20,000 years ago. More at NASA. Read the entire study here. Image source: NASA/Chandra/CSIRO.